I am writing this devotion from a hotel room overlooking the lake at Harrison Hot Springs, B.C. Our church women have just had a mountaintop (actually lakeside) experience of our own with meaningful conversations, laughter, walks, times in the pool, too much fabulous food, sweet worship led by talented musicians, interesting workshops, challenging talks from a woman whose passion for God, His word and her marriage is contagious. And so I'm saying with Peter when he was on the moutain with Jesus: "It is good for us to be here." But the disciples didn't get to stay on their mountain. All too soon the heavenly vision of Moses, Elijah and Jesus faded and "they saw no one but Jesus only" (a sight that for us would still be visional). Sadly, neither do we get to tabernacle here, in this setting with these friends, focusing on the things of God. Jesus' words to the disciples as they descended the mountain are curious: "Tell the vision to no one until the Son of Man is risen from the dead." I'm understanding this to mean, don't talk about what you've heard and seen until you understand it in its larger context. Perhaps God would say something similar to us as we "come down" from spiritual highs. For the disciples it was a matter of fitting what they had seen into the big picture of who Jesus was, and what He had come to do, which was still in the future. 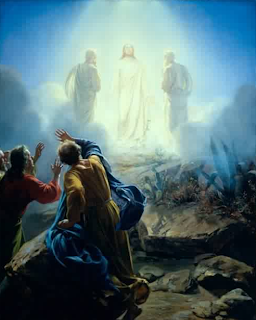 They would understand this transfiguration mount experience far better after Jesus had risen and ascended to God. For us it may mean that we shouldn't be too quick to analyze, explain, and pigeon-hole what we have seen and heard during times of spiritual intensity. Rather we need to trust that God has done something which we will understand more fully in the context of more time. It could also mean that we shouldn't dissipate spiritual energy and enthusiasm by being all talk. One of the things that fiction writers find is that to talk too much about a work-in-progress is to shift the balance of creative energy so that the deep driving need to tell the story is no longer there. I sometimes wonder if, when we talk a lot about a spiritual turning-point, we do something similar — short-circuit living it out because we feel, as we talk about it, that we've already done it. Let's instead have a Mary-heart that watches and ponders God's initiatives with us. Let's neither build them up nor trivialize them but be open and watchful for what He will do in us and through us us now and in the future as a result of what we have heard and seen. PRAYER: Dear God, thank You for special times with You. Help me not to dissipate the energy of these times with only talk, but watch how You will use them in ways I don't yet foresee. Amen.